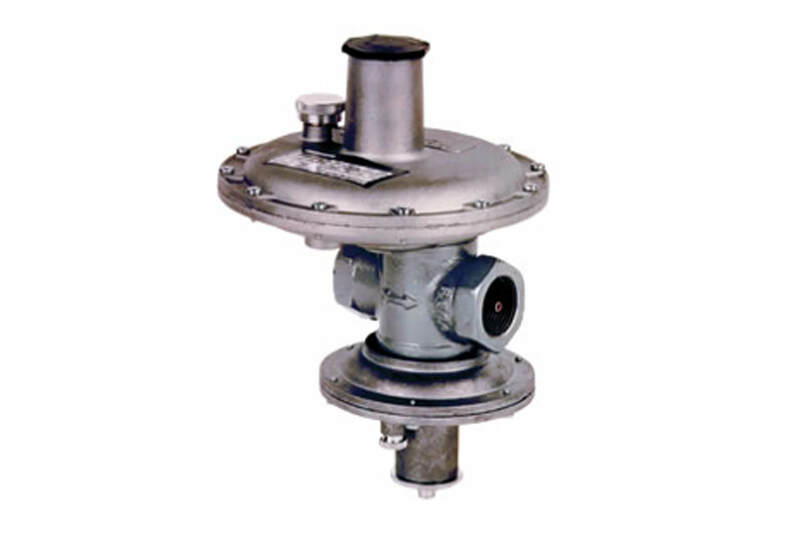 The RB 2000 regulator is designed for applications and for all installations with continuous consumption or rapid flow rate variations, such as burners, industrial ovens, boilers. It is suitable for installation in cabinets as a space-saving regulator. The RB 2000 regulator is a direct-acting, spring-loaded regulator (lever type) with a built-in relief valve and optional safety shut-off device.The balanced valve ensures constant outlet pressure when the upstream pressure varies.This eliminates changes to the orifice size arising from different inlet pressure ranges. The regulator is equipped with a built-in filter (filtration grade 0.5 mm). The safety shut-off valve cuts the gas flow when the outlet pressure exceeds the set pressure (OPSO) or when it drops below the set value (UPSO). It remains closed until the valve is reset manually. The RB 2000 service regulator is a high-performance regulator with a large effective diaphragm area and powerful lever ratio. The balanced valve design provides constant outlet pressure under all inlet pressure conditions. Typical applications include demanding residential and commercial services as well as small industrial services. The RB 2000 features an integral shut-off valve for over and under-pressure protection, a creep relief valve and a valve protection strainer.